My parents who spent the last two years in India, have become rice snobs. I don’t know much about rice, or think too much about it. To me it’s a side dish, serviceable, and functional, but not really worthy of notice. My parents however are attuned to the subtle differences in texture, flavour, and aroma that distinguish great rice from the mediocre. I used the same basmati I always do for this dish (I bought a big burlap sack long ago, and I’m still working my way through it) but it came out much better than I could possibly have imagined. This rice was shockingly good, good enough to get me to rethink my whole position on rice. 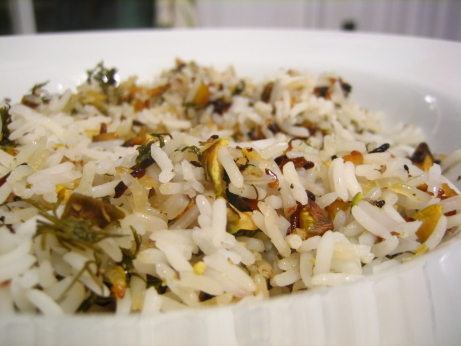 In this dish basmati is rinsed in multiple changes of water, and boiled uncovered for a few minutes. Then things get weird. The rice is strained and allowed to drain while butter is melted in the bottom of the pot. The rice then goes back into the pot with alternating layers of chopped pistachios and fresh dill. You then poke holes in the layers of rice with with the back of a wooden spoon (to let steam move about? ), and let it steam covered both with a kitchen towel and a lid for 30-35 minutes over moderately low heat. You then let it stand for a further half-hour, and serve. This procedure builts up a crispy and deeply browned crust on the bottom called the tah-dig. The tah-dig is supposed to form a solid layer on the bottom of the pot, which you’re able to get out whole, and then break up and serve on top of the rice. The tah-dig is the most prized part of this dish, so everyone should be allotted his fair share. My tah-dig didn’t stay together, and it just crumbled in with the rest of the rice, so I mixed it in thouroughly to make sure everyone got some. This rice is just absolutely amazing. It was perfectly cooked, I worried it would be overdone with such a long cooking time, but each grain was whole, and just slightly toothsome. The pistachio and dill flavours permeated the rice, but it was quite a subtle effect, and a delicious one. The grains in the tah-dig were cooked directly in butter, so they were about as overwhelmingly magnificent as you’d expect, with the very deep nuttiness of both browned butter, and roasted rice. I’m having trouble finding words to express how much I liked this rice, it’s really easy to make, and you owe it to yourself to try it. I served the rice with a spicy Georgian stew on top, which was a mistake. The stew was excellent, and the flavours were complimentary, but this rice deserves to be eaten on it’s own. I can only imagine how wonderful this rice would be with grilled or poached salmon. This is far and away the best rice I have ever had, and I just can’t wait to make it again. It has absolutely earned its five mushroom rating. Ohhhh–I’ve made rice like this before and I practically died and went to heaven when I ate it. I didn’t know that was the technique used here–I’ll definitely make this soon because this rice vs. ordinary rice is like Maison du Chocolat vs. Nestle’s. I’m with you on rice in general, too. I just don’t eat it much, and actually I’ve cooked almost nothing out of that chapter. Time to change that. And I’m starting with this one! Oh man, I love me some rice (especially with butter) and this sounds wonderful. The only problem is that now I use brown rice. I have some really nice brown basmati — I wonder if there is any way to make that work. Never heard of this technique before. I love using basmati rice so i’ll have to remember this the next time I use it. Wow. Definitely exotic, definitely intriguing. Bookmarking this one. This looks absolutely beautiful and delicious. I love the taste and fragrance of basmati rice and am going to try this recipe. Liz: I’m sure brown rice would work wonderfully in this recipe, you’d have to adjust the cooking time a bit, but I say give it a try! Lobster: Good luck, let me know how it goes. Eatingclub: Great, I hope it turns out well for you. Victoria: I’m also a big basmati fan. My default rice choices are basmati for most everything, and calrose if I want sticky rice. I flirt jasmine and arborio, but basmati is my first and truest love.